One would think that if you consecutively led the first 190 laps of a 200 lap race, then you should effectively have no problem leading the last ten laps, right? Not at Daytona. The last time a polesitter, the driver who starts the race in first place, took the checkered flag at Daytona happened a whopping 19 years ago when Dale Jarrett took the number 88 to his third and final Daytona 500 victory. In the 18 races since Jarrett’s victory, half of them have been won by a driver who started tenth or worse while only one of them was won by a driver starting in a podium position. To put this into perspective, the Formula 1 Monaco Grand Prix had 11 of the past 15 races won by a polesitter. This goes to show just how difficult it is to predict a Daytona winner from the first wave of the green flag. The Daytona 500 is almost impossible to predict. As ESPN’s Peter Keating put it, it’s the most random sports event in America. So, we decided to have some fun. 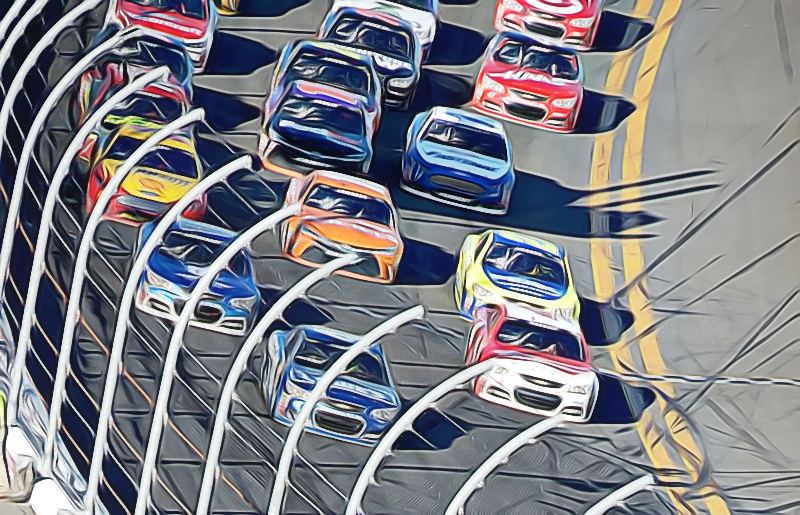 Using a statistical analysis tool called JMP, we decided to examine a factor from the 2017 and 2018 Daytona races that should not have any correlation with driver performance: Color. However, instead of betting on a Daytona race win, could we predict if a driver will finish with at least 30 points? For context, the race winner gets 40 points in a race weekend. There is a 5-point gap to second place, who gets 35 points. From there on, each driver gets one less point than the driver who finishes directly in front of them, equating to seventh place getting 30 points. There are 40 drivers in each Daytona race, but the slowest 5 drivers each get one point. Using a car’s primary and secondary color and finishing points from the previous two Daytona races, we generated some pretty interesting results. Only 9 of the 62 cars whose primary color was blue, black, white, green or orange scored over 30 points in either race weekend. From these 62 cars, 21 of them had a secondary color of either blue, gold, green, grey, rainbow, silver, or yellow, and all 21 of them failed to score at least 30 points in either weekend! Additionally, of the 18 cars whose primary color was purple, yellow, or red, eight of them scored at least 30 points in either weekend. Only 17 drivers out of the 80 scored at least 30 points over the past two Daytona races. Let’s consider our polesitter this Sunday, William Byron. He has not started on pole nor won a race at Daytona before. According to our JMP results, Byron falls under a primary and secondary color combination that has not yielded a single driver scoring over 30 points on either Sunday. On the contrary, the 52 car driven by Cody Ware has a red primary color and white secondary color. Four of the eight drivers with this color combination came out with over 30 points in either race weekend, but Ware is significantly slower than polesitter Byron during qualifying. Can Byron become the first driver in the past three years to score over 30 points with his primary and secondary color combination, or will Cody Ware show strong pace on Sunday and score big points for his team? Tune in Sunday at 2:30 EST to find out!